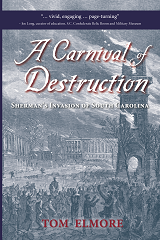 I bought your book “Carnival of Destruction” at a pawleys island bookshop and tremendously enjoyed it. It enriched my long drive home to western Pennsylvania as I passed through Cheraw and other small towns on part of Sherman’s route. Thanks for your hard work and scholarship.